Chicago (Nov. 2018) – Salina Central High School in Kansas celebrated the completion of its expansion and renovation project in March 2018. Originally constructed in 1952, the facility had not received many improvements through the decades. 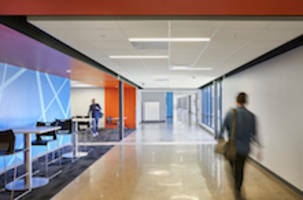 Maintaining the school's sense of history, DLR Group and Jones Gillam Renz Architects designed an updated and larger facility to provide more space and modern features to better serve its 1,000 students in grades 9-12. Blending new construction with renovated areas, Rockfon ceiling systems were installed throughout the 60,000-square-foot high school. The high school now encompasses renovated computer labs, commons and athletics areas; a new auxiliary gym that doubles as a storm shelter; new art, theater and music areas; new administrative offices, a new career and technical education center; and new science and drama classrooms. On average, 700 to 800 square feet was added to each classroom along with their new ceilings. "Being that a major goal of the project was modernizing a dated building, we needed a ceiling that was aesthetically clean and modern looking. At the end of the day, this is a school, so things like maintenance, sound reduction, quality and longevity are critical," explained Ian Kilpatrick, DLR Group architect. Addressing each of these ceiling requirements, Rockfon's district manager Jim Frasca noted, "Rockfon Artic acoustic stone wool ceiling panels, baffles and islands offer a durable, low-maintenance, quality system; a good Noise Reduction Coefficient (NRC); a nice, white, smooth finish; and a high-end look at an economical price. In addition, our 2-inch Infinity perimeter trim creates a neat, clean edge for the ceilings." Kilpatrick agreed and added, "A great advantage of Rockfon's product offerings is that we were largely able to provide one manufacturer of ceilings throughout the entire facility, while still incorporating many different ceiling solutions." For the majority of the classrooms, hallways, offices and commons areas, Rockfon Artic® acoustic stone wool ceiling panels with a square edge were the approved solution. These panels, in either 2-by-2 or 2-by-4 sizes, were suspended within Rockfon Chicago Metallic™ 1200 Series 15/16-inch grid, and finished with Rockfon® Infinity® 2-inch engineered perimeter trim. In the stairwells, Rockfon® Contour™ stone wool, frameless acoustic baffles help control the noise of students passing between their classes. Also helping optimize acoustics and daylight, Rockfon® Island™ acoustic stone wool panels were directly mounted to the ceiling of both the art education area and the new two-story media center. The 4-by-4 sized, white panels not only provide high sound absorption, but also diffuse and reflect up to 86 percent of light to help reduce energy demands. Beyond performance, Salina Central High School Principal Nate Showman called the media center's interior a "showstopper." It serves as the hub of the high school, and remains open late for students to work on projects and to have after-school meetings. DLR Group's design of Salina Central High School stems from a number of collaborative workshops and discussions with the high school design team, according to Kilpatrick. He described, "A strong desire to relocate and redefine the main and student entry, coupled with the guiding principles, became the driving force behind the design. A new north/south axis along the main circulation spine of the school provides a framework to organize key spaces." He continued, "The new construction spaces are dispersed throughout the existing building to blur the lines of new and old, meshing all parts of the building into a unified new high school environment. Renovated spaces modernize and transform existing, aging and undersized learning environments." In April 2014, the Salina Central High School project was approved as part of $110 million in district-wide improvements. In total, the high school's completed project cost approximately $31 million and took nearly two years. Construction began in 2016 and continued in coordinated phases through 2018. "It was a giant collaborative effort from top to bottom making sure that this thing went as smoothly as possible," said Matt Hohn, senior superintendent at McCownGordon Construction. At the ribbon-cutting celebration in March, Principal Showman told the Salina Journal, "This project was a complex renovation of a huge and remarkable building, and it took place while school was in session. Our teachers, office staff, instructional assistants and maintenance team have worked tirelessly to ensure that our students had a clean, safe and inviting instructional environment to come to each day. They have packed and unpacked multiple times and have seen their building change right before their eyes." Working closely with McCownGordon and Rockfon's distributor Drywall Supply, ceiling installation contractor Drywall Systems began its work on site in June 2016. As much of the work as possible was done during summer months. "We planned accordingly and worked around the students as much as needed when school was in session," said Tim Rogers, general manager of Drywall Systems. Because Rockfon's stone wool products resist water, moisture and humidity, they can be installed before a building is enclosed and when a school's HVAC system is turned off for summer break. Drywall Systems' installation team liked working with Rockfon's products. They are lighter weight than many other ceiling products on the market, making them easier to carry and to put into place. Rogers noted, "It's a nice system and also price competitive." Salina Public Schools' executive director of operations, Kris Upson, P.E., praised the project's solution-focused, value-driven approach. "School districts typically go after the lowest bid," he said. "We did not do that in this case because we took the best value concept to heart. Best value doesn't necessarily mean the cheapest." "Rockfon Artic's smooth finish presents a high-quality appearance and good performance at a great value," reiterated Frasca. "Salina Central's new ceilings help absorb the noise reflected by the many hard surfaces in the historic school. This allows teachers to be heard and understood, and to students to concentrate on their studies." The students also expressed their appreciation for the improved high school. "From how much the school has changed from this year to last year is pretty incredible," concluded Jeremy Vaupel, 2018-19 junior. "It's really livened up the school, made it look a lot more professional and modern."